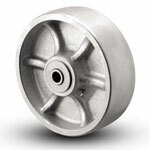 Wheel Face - Machined flat with round edges to minimize floor wear. Bearings - Choice of several types; straight roller, Oilex, ball, or tapered roller. Seals - All wheels that have 1-3/16" bore and either a 1-5/8" or 2-3/16" hub length equipped with 3/4" straight roller bearings have as a standard feature nylon seal retaining/thrust washers which add 3/16" to hub length and are supplied with 1/2" ID hardened spanner. Lubrication - All straight roller and ball bearing wheels with 1-3/8", 1-5/8" and 2-3/16" hub length are normally lubricated through hollow axle but can be supplied with hub lubrication in most cases. Consult factory. Wheels with 2-3/4" or longer hub length have hub lubricators with the exception of the 4" x 3" and 4" x 4" wheels.